How do I instant message other Players? In their profile page, click the ‘Message’ button to open up a chat box. 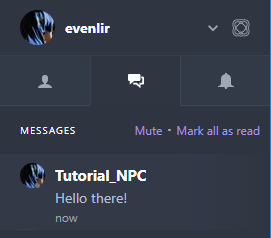 Or if you’ve already messaged them, you can check your existing messages in the sidebar and continue the conversation from there! It is also possible to message your friends from the sidebar. Just click the &apos;Message&apos; icon next to their username under the Friends Online tab.